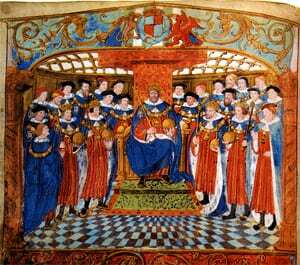 The Most Noble Order of the Garter is among the earliest of numerous orders of chivalry founded during the Middle Ages in the major courts of Europe. But it stands distinct from its peers on two counts. First, for the particular prestige that has always been attached to the order, and second for its survival to the present day. The establishment of the order was inextricably bound up with the interests and political circumstances of its founder, Edward III (1327-77). Throughout the Middle Ages the kings of England laid claim to the French throne. Edward III, who early in life established a formidable reputation as a soldier, was very active in asserting this claim and in so doing initiated the long-running but intermittent hostility between England and France popularly known as the Hundred Years War. He also shared in the widespread medieval fascination with the figure of King Arthur, a paragon of kingly and knightly virtue. In 1344 Edward III made a spectacular demonstration of his interest in Arthurian legend during a massive joust at Windsor. On this occasion he promised to renew King Arthur’s celebrated fraternity of knights, the Round Table, with its complement of 300 men. Work even began on a gigantic circular building two-hundred feet across within the upper ward of the castle to house this so-called Order of the Round Table. The renewal of war with France intervened with this project but in 1348 it was revived in a different guise. 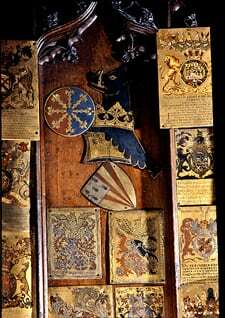 When founding the new college of St George at Windsor Edward III associated with it a small group of knights, each of whom was provided with a stall in the chapel. This comprised twenty-five men in all with the king at their head and was entitled the Order of the Garter after the symbol of the garter worn by its members. The use of what seems – to modern sensibilities – such a curious emblem has given rise to a popular legend about the foundation of the order. According to this, the Countess of Salisbury lost her garter during a court ball at Calais and Edward III retrieved it, rebuking those who had mocked her embarrassment with the words “Honi soit qui mal y pense” – shame on him who thinks evil of it – But this phrase, the motto of the order, actually refers to the king’s claim to the French throne, a claim which the Knights of the Garter were created to help prosecute. As to the emblem of the Garter, it may perhaps less interestingly, derive from the straps used to fasten plates of armour. From the first the Order with its twenty-six so-called Companions was internationally constituted and this led to a distinction in its membership between Knights Subject, who were subjects of the English Crown, and Stranger Knights. Women were also associated with the Order in the Middle Ages and issued with its robes, although they were not counted as Companions. Such association ceased in the reign of Henry VII (1485-1509) but was revived in 1901, when King Edward VII appointed Queen Alexandra a Lady of the Order of the Garter. The first woman to be appointed a full Companion of the Order was Lavinia, Duchess of Norfolk, in 1990. Besides the twenty-six Companions various supernumerary appointments have been made to the Order since the reign of George III, all of them immediate members of the Royal family. Since 1813 all Stranger Knights have also been supernumerary appointments. As part of the college of St George, Edward III established a community of twenty-six impoverished military veterans called Poor Knights. This community of bedesmen, which received food and lodging from the college, was charged with praying for the king and the knights of the Order. But for lack of funds few Poor Knights were actually appointed and accordingly Elizabeth I reconstituted their community. In pursuance of the wishes of her father, Henry VIII, she reduced the number of Poor Knights to thirteen and properly endowed this wing of the foundation. In 1834 the members of this body were renamed Military Knights.